Mud is not just inconvenient for horses and owners – it's unhealthy, and even dangerous. 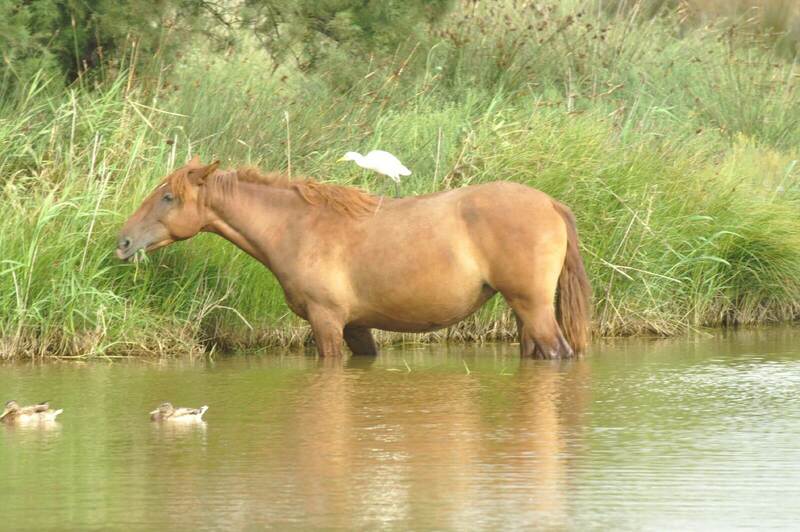 Mud harbors bacteria and can lead to equine health conditions such as scratches. Mud can cause horses to strain or tear ligaments and tendons, and a slip or a fall in mud can bring about additional injuries. If you have too much mud in your pastures, it's important to take steps to reduce – and eventually eliminate – its presence. Mud is created by drainage issues. Evaluate your property and take a good look at the path that water takes. Chances are it ends up standing in particular corners or sections of your pastures, leading to a muddy mess. The first step you need to take is to get control of the drainage. Installing a drainage system can give you more control over the flow of water over your property, but there are also more minor steps you can take in the meantime. Make sure that water which drains off of your barn roof is directed away from the pastures. Never empty water troughs into the pastures themselves; carry the water away in smaller buckets to keep it from adding to the amount of moisture your pasture grounds must absorb. If areas of your pasture are truly turning into muddy pits, you may need to be a bit more active in your approach. Bringing in additional footing, such as small gravel, to build up depressed areas can help to battle mud. If the area surrounding your pasture gates is predominantly the problem, then you might want to look into relocating the gates to an area with a higher geography to better withstand the horse traffic. Pastures with grass are more able to absorb water, making the chance of mud occurring less likely. It is important to give your pastures time to recover from grazing. Don't allow your horses to graze the grass down to stubs; when they graze the grass down to two or three inches, it's time to pull them off of the pasture to give it some time to revive. Depending on the size of your pasture, you may be able to put up a line of fencing to give part of your pasture time to recover from equine traffic. Otherwise, you'll need to have another pasture ready so that you can rotate your horses back and forth. Doing so will not only give your pasture grass time to recover, but it will also give your horses access to fresh pasture. Mud is easier to prevent than it is to remedy, so do all that you can to keep it from becoming an issue. Your horse's health and safety will be better off for it.